Previous Article Wild About Pemberley Jones! Alima Pure and Weleda For The Win! Both these products sound wonderful, I’d love to try them! I definitely could use both these products and love your reviews of them! i love a face mask! also in powder form means i can choose the consistency and the balm sounds so great, for all parts of the body! The Acure Organics Line Eraser sounds fantastic! I’ve been looking for such a product since I gave up retin-a products a few years ago. Thanks for such a lovely giveaway! P.s. This mask has been on my to try list… The tourmaline just seems so cool! I really enjoy Acure products! I currently look like a green sea monster with their mask on! because I love face masks and I need to get rid of some dark spots on my skin! thanks for the giveaway! CONGRATS on 1000! After raving so much about Acure, I’m not surprised you’re sharing the love with a giveaway Nice work! 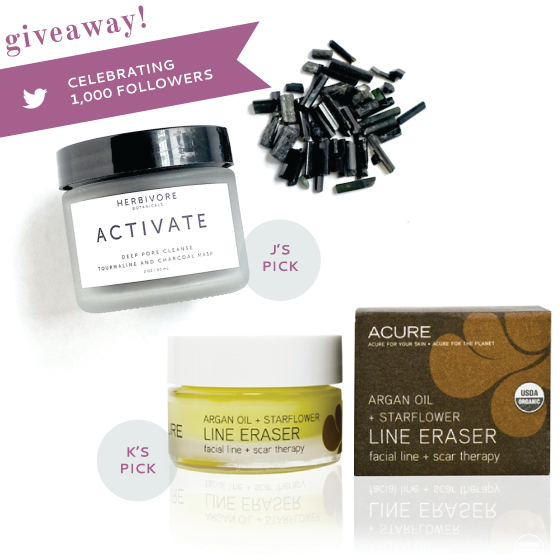 I love Acure and would love to try the line eraser! And I’ve never tried anything from Herbivore. Thanks for the giveaway and congrats! Congrats ladies! I’ve loved reading your blog and chatting with you! I’ve been wanting to try a mask from Herbivore Botanicals and this one sounds amazing. Acure Organics is also a favorite brand of mine but I haven’t tried the Line Eraser yet! I have never tried anything from Herbivore Botanicals and this mask is just what my skin is craving for! I love Acure Organics Brightening Scrub, and Im sure the Line Eraser would work wonders on my pesky fine lines! I would love to try the mask, i have big pores so it might work for me ! Congrats ladies! I’m dying to try the acure line eraser after that glowing review a little while back! Congratulations you guys! Awesome accomplishment to reach 1000 followers on twitter. I would love to win these products because I haven’t tried any of these brand before (I know crazy right!?). Also the Herbivore Botanicals Activate Facial Mask seems perfect for my skin type! I’d love to try the masks cause I have large pores! I just starting trying Acure and I’m in love! I haven’t tried the other brand but would love to as it all sounds amazing. I would love to win because I’ve just recently made the decision to switch to products that are better for me rather then using products with all of those terrible chemicals! I love Acure Organics and the charcoal in the mask sounds so interesting! I’d like to try them both as I’ve not tried anything from these brands before and they look fab – love the frosted Herbivore packaging …but I’ve been especially interested in the line eraser since Kathryne’s Acure picks post! Great giveaway ladies! Ever since Jen introduced Herbivore Botanicals into my life I knew I needed more! Have to say, the Acure Line Eraser sure sounds like a winner too – diminish old acne scars? I’m so on that! I really want the mask! My pores need a vacuuming. i need to start a proper skincare routine! Congrats girls! Thanks for the chance, I’m always looking to try new green goodies! Im excited to try the activate facial mask. The fact that it is a powder is so interesting to me. I love that it’s not full of preservatives and chemicals. I’ve long been a fan of charcoal in cleansers as I tend to have combination skin and areas of breakouts ocassionally. My skin is sensitive and natural, charcoal based products have always worked well for me. I would be thrilled to try these products. They all look so lovely! and acure organics is already a staple in my routine.I love acure body wash,hair care so i am very positive about this one too. I’d love to try these products because I’ve never tried them before. I’ve been eyeing Herbivore Botanicals but hae never taken the plunge and even though I’m an Acure Organics fan I’ve yet to try the Line eraser. Congrats on 1,000 followers! I would like to try these products because I would love a deep pore cleansing mask and the Line Eraser would be great for old acne scars. I would like to try the NEW ACURE Castille soaps!